Sri Lanka’s one of the most challenging problems is providing, efficient, cost effective and environment friendly transport services. Underprivileged conditions in public transport such as bus and rail transport in Sri Lanka have given rise to a formation of Informal Public Transport (IPT) modes such as three wheelers or autos. Further, rising urbanization, population and industrial development has significantly augmented the demand for urban transport services. As a result, demand for comfortable yet affordable public transport has become predictably high, which is the major factor for the growth of three wheelers market in Sri Lanka. Moreover, in Sri Lanka some families are buying three wheelers for private use majorly attracted by the lower of three wheelers as compared to passenger cars. Goldstein Research analyst forecast the Sri Lanka had 10.1 million registered three wheelers in 2016, with more than 75,000 vehicles being imported in that year. Further, Sri Lanka three wheelers market to grow at a CAGR of 7.2% during the period 2016-2024. On the basis of vehicle type, passenger three wheelers accounted for the largest revenue share as more than 70% three wheelers sold in Sri Lanka are passenger carriers and only 30% are goods carriers. Moreover, passenger carrier three wheelers are likely to maintain their dominance over the forecast period as households who cannot afford cars are buying three wheelers for personal use. According to our Sri Lanka three wheelers market study on the basis of extensive primary and secondary research, one of the major trends that driving the growth of three wheelers market are mobile app based on demand taxi services. Uber, OLA and other app-based taxi services, which use automobiles, has successfully expanded globally and similar apps are connecting people with three-wheelers in Sri Lanka, which is a major boost for the three wheelers market growth in Sri Lanka. According to the report, major driver in Sri Lankan three wheelers market is insufficient road and rail transport to meet daily travelers need. Three-wheelers in Sri Lanka will continue to grow as they serve a need in urban and rural areas as important mode of transportation in last mile connectivity. They are a source of employment for many and cheap mode of transport, which is likely to drive the growth of three wheelers market in Sri Lanka. Further, the report states that one challenge in Sri Lanka three wheelers market are the regulatory moves by the government such as hike in import duty. To reduce the number of accidents from three wheelers and to adopt electric three wheelers in the country government is planning complete ban on import of three wheelers which is the major challenge for the three-wheelers market growth. The report covers the present ground scenario and the future growth prospects of the Sri Lanka three wheelers market for 2016-2024 along with the total sales of three wheelers in every region. We calculated the market size and revenue share on the basis of revenue generated from the sales of three wheelers by various industry players across the Sri Lanka. 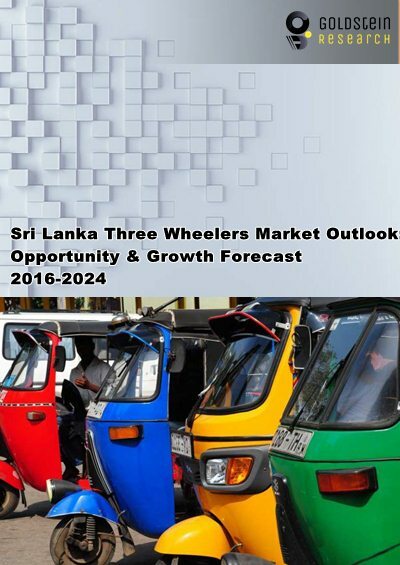 Sri Lanka Three Wheelers Market Report has been prepared based on an in-depth market analysis from industry experts. The report covers the competitive landscape and current position of major players in the Sri Lanka three wheelers market. The report also includes porter’s five force model, SWOT analysis, company profiling, business strategies of market players and their business models. Sri Lanka three wheelers market report also recognizes value chain analysis to understand the cost differentiation to provide competitive advantage to the existing and new entry players. Our Sri Lanka three wheelers market report comprises of the following companies as the key players in the Sri Lanka three wheelers market: Bajaj Auto, Piaggio Vehicles, Atul Auto and TVS Motor Company.